OpenIO SLS-4U96 brings together the power efficiency of ARM CPUs, high capacity drives and 40 Gb/s Ethernet backend. OpenIO Inc., the next generation all-in-one object storage and data processing solution provider, today announced the release of SLS (ServerLess Storage) platform. This new storage appliance combines the power efficiency of ARM CPUs, high capacity drives and a 40Gb/s Ethernet backend. This highly scalable, fast, and reliable energy-saving appliance offers best-in-class storage at low cost. “Teaming up with Marvell, we are achieving the vision we had while designing OpenIO SDS. The SLS-4U96 hardware appliance revolutionizes the storage landscape by providing network HDDs as an industrial reality. Today, we are thrilled to see these new platforms shipping and going live at our customers' premises. It is truly the latest step in the storage hardware evolution.” said Laurent Denel, CEO of OpenIO. This new product is based on the new innovative Marvell Armada-3700 Dual core ARM v8 @1.2Ghz based nano-node architecture (http://www.marvell.com/embedded-processors/armada-3700/index.jsp). SLS-4U96 appliances can host up to 96 nano-nodes, each one with a dedicated 3.5" HDD or SSD and dual 2.5Gb/s SGMII ports, dual 6-port 40Gb/sec Ethernet backend Marvell Prestera family switches for external connectivity and N+1 power supplies. This offers the scalability and efficiency of a petabyte scale-out storage system in a compact 4U chassis with the ease of use of OpenIO SDS 16.10, perfect for service providers and enterprises of any size. 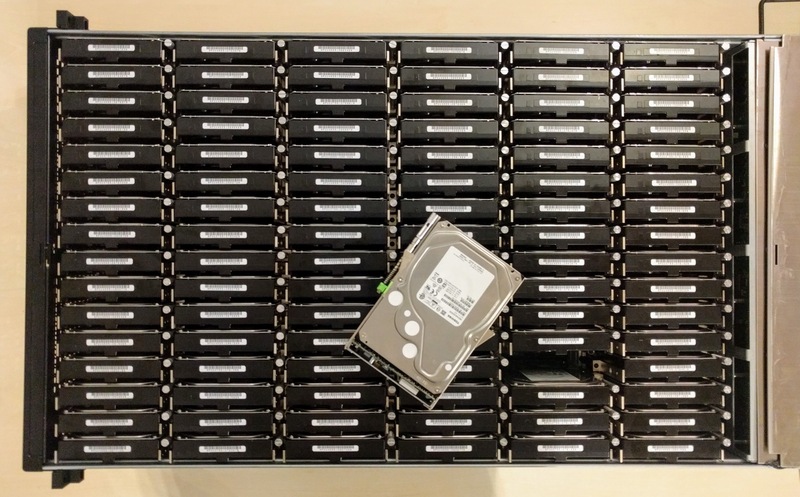 From 3 to 96 hot swappable nano-nodes per appliances for a maximum of 960TB with 10TB HDDs or 1152TB with recently introduced 12TB HDDs. Two 6-port 40Gb/s port switches backend for for both client connectivity and direct chassis interconnect, which can scale up to more than 10PB per rack. 4 N+1 power supplies and 5 removable fan modules. Automatic nano-node discovery, setup and load balancing. Easy to use management via a web GUI, CLI and API. Local and geo-distributed object replica or erasure coding. Quick fault detection and recovery. S3, Swift and Native object APIs. Multiple file sharing access methods: NFS, SMB, FTP, FUSE. Fully compatible with existing x86 based SDS installations. Thanks to the nano-node architecture, OpenIO SLS introduces a new paradigm for management and maintenance of scale-out storage infrastructures. The failure domain is limited to a single nano-node, equivalent to a disk, that can be replaced as needed when failure occurs. New or replaced nano-nodes join the SLS resource pool without needing a rebalancing operation. The entire process takes less than 60 seconds and does not impact performance. Marvell is a global leader in providing complete silicon solutions. From storage to cloud infrastructure), connectivity and multimedia, Marvell’s diverse product portfolio aligns complete platform designs with industry-leading performance, security, reliability and efficiency. At the core of the world’s most powerful consumer, network and enterprise systems, Marvell empowers partners and their customers to always stand at the forefront of innovation, performance and mass appeal. By providing people around the world with mobility and ease of access to services adding value to their social, personal and work lives, Marvell is committed to enhancing the human experience. As used in this release, the term "Marvell" refers to Marvell Technology Group Ltd. and its subsidiaries. For more information, please visit http://www.Marvell.com. OpenIO brings the future of object storage to businesses of all sizes today. It offers the most flexible and versatile solution to solve the scale-out challenges businesses face, from 1TB to thousands of PetaBytes. This open-source solution provides a new way to build backend services for applications, allowing companies to combine data processing and storage on a single platform. The future of storage is here. Find out more at http://www.openio.io, and follow @openio on Twitter.